This text is a reproduction of a module written by Jayme Johnson for Teaching Children Philosophy, a project Story Philosophy contributes to through translations and original contributions of picture book based philosophical discussion modules. 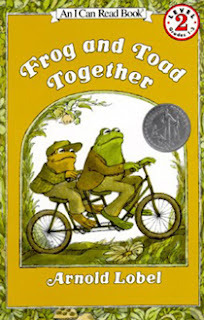 In order to have cookies for later, and to avoid some serious belly aches, Frog and Toad need to stop eating cookies. Will Frog and Toad be able to muster up the will power they need to stop eating cookies before they become sick? Have you ever told a friend to take the last bit of dessert with them? Or even better, have you ever told yourself you had better just polish off that last piece of pie so that its gone and out of the way? Perhaps both were attempts at doing the same thing: undermining your own lack of will power. So which do you want to do, eat the pie, or not eat the pie? The problem is that it seems to us in these moments that we want both! 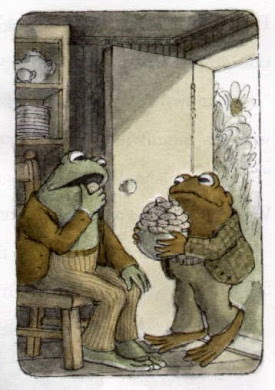 In the story "Cookies" by Arnold Lobel, Frog and Toad are met with a similar dilemma. They want to stop eating the cookies before they become ill, but the cookies taste so good that they just can't seem to stop eating them. Frog realizes that the problem is that they need will power to stop eating the cookies. He defines will power as "trying hard not to do something that you really want to do." In doing so, Frog raises an interesting philosophical issue. Does having will power just mean trying not to do something, or does it mean actually not doing it? Moreover, does not doing something that you really want to do always require having will power, or just sometimes? These kinds of questions inspire a philosophical discussion on the nature of will power. "Cookies" explores the topic of will power in an amusing and light-hearted way. But behind this lies an interesting puzzle. The puzzle emerges when we realize that Frog's definition of will power seems to lead to an absurd conclusion. Consider it as follows. First, Frog declares that he wants to cease with eating cookies before he gets sick. Why? Simple, of course: Frog does not want to get sick. However, Frog also says that having will power is trying hard not to do something that you really want to do. Since Frog needs will power to stop eating cookies, and given his definition, it is safe to say that Frog really wants to keep eating cookies. Yet Frog knows that if he keeps eating cookies, that he will definitely get sick...and soon! So if all of this is true, then Frog has contradictory beliefs. He really wants not to get sick. But he also really wants to get sick too. But that's impossible. So here is the real problem: if having will power means having to believe two contradictory things at the same time, then it seems like having will power is impossible! But that just doesn't seem right. So what are we to do? What Frog says about will power makes sense, but something must be amiss, for if he is right, then having will power requires us to do the impossible. But that doesn't seem right. Many of us can think of examples in our own lives in which someone had will power over something. So how are we to solve this puzzle? One thing we might do is throw up our hands and say, "So it goes. I guess having will power is impossible!" But I don't think that we should give up so easily. Especially given how common cases of people demonstrating will power seem to be. Another thing we could do is try to show that Frog does not really desire contradictory things. One way to do this might be to compartmentalize Frog's desires so that no one part him is in contradiction. Part of Frog, we might say, wants not to be sick. Another part of Frog want to keep eating cookies, even if it means getting sick. To make sense of this, however, requires making sense of what it means to talk about part of Frog wanting something. Can different aspects of the same person (or Frog!) want different thing? Plato thought so. He talks about parts of the soul in his work "The Republic". Here Plato theorizes that the soul has three parts (1) desire (2) emotion and (3) reason. Plato would say that part of Frog, the desire part, will always want more cookies, or whatever else if fancies. It is the job of the other parts of the soul to make sure that desire does not go unchecked. So the reason part of Frog, Plato might say, realizes that too many more cookies = tummy ache, and the emotion part is supposed to work to keep desire at bay as much as it needs to. From this perspective how much will power someone has is determined by how well that person keeps desire under control. So Frog lacks will power because he lacks strength of either emotion or reason, but has a very strong desire. Plato might tell Frog that if he really understood that any more cookies will make him sick, it would be easy not to eat them. Of course there are other ways to solve the puzzle as well, and any potential solution is sure to bring about lively philosophical discussions. Is wanting to continue to eat or drink something even when you fear you will get sick the same as wanting to get sick? If part of you wants to do something, and another part doesn't, where are these parts? Are they in our minds? What kind of parts are they? Are they like fingers and toes? Or more like ideas? Are any of these parts in charge of the rest of them? Which one? Does thinking about ourselves as having different parts help us understand the problem that Frog and Toad have with the cookies? Who do you think has more will power, Frog, or Toad? Do you think Frog will visit Toad later and eat cake? If there are no more cookies left to eat, are Frog and Toad really exercising will power by not eating them? This text is a reproduction of a module written by Jayme Johnson and translated by me for Teaching Children Philosophy, a project Story Philosophy contributes to through translations and original contributions of picture book based philosophical discussion modules. (c) of all the illustrations in this post, Arnold Lobel, 1971.